Gifts don’t have to take up a lot of space to be full of heart. I know few people who can honestly say, “I don’t own enough stuff”—at least not in America, where we have consumer fever so bad we ransack stores during the holiday season like starving wolves picking a caribou carcass clean. I grew up in a big farmhouse with lots of space, and we filled every nook and cranny. (Granted, there were five of us, and we often entertained long-term guests, usually extended family—so we also filled that space with memories.) But I knew how much work it took to keep that house clean and how difficult it was to manage that much stuff. And since I moved out on my own, I’ve always lived in small places—apartments or tiny houses—where keeping everything I’ve ever owned wasn’t an option. I love tearing into presents under the tree. I’m a Sagittarius, and I like the excitement and anticipation that comes with gift giving and receiving. (I’m often more excited watching someone open a gift I bought them than I am opening my own presents.) But I think we’re at a stage where we can look for ways to give gifts that don’t just add to the clutter of our busy lives. I believe that often times, less is more. Here are a few ideas that I’ve come up with. Feel free to share your own. I’m always open to new ideas! 1.) Secret (or not-so-secret) Santa. In my family, by Christmas day, we all know who got whose name, but it’s the spirit that counts. Simply set a price limit (we generally do $25) and draw a name from a hat. Instead of buying seven or eight gifts, you’re buying one. You also have more time to focus on buying something unique for that person. My husband and I do this with both my family and his, and I can assure you that the spirit and joy of the holiday is not at all hindered by the fact that we get fewer gifts. If anything, it’s enhanced. 2.) Give an experience, not an object. Give a stressed-out mom a day (or afternoon) at the spa, a busy couple a gift card for their favorite restaurant, a music lover tickets to a concert. If the recipient has always wanted to learn French cooking, yoga, karate, or guitar, now could be a time to treat them to an experience instead of buying something that they’ll have to find a place for. I always love a gift card to Target, but if you want something more personal, you can purchase a gift certificate or card that appeals to the recipient’s unique tastes and interests. 3.) The much-loved basket full of goodies. I love filling baskets with handmade soaps, all-natural bath products, or the recipient’s favorite foods. My mother-in-law used to make homemade hot cocoa mix and put it in a mason jar topped with a piece of festive cloth and ribbon. It never went unused. If you’re a cook, baked goods in a Christmas tin will make a yummy treat. Farmers markets and natural-food stores often stock locally made products, anything from artisan cheeses to all-natural lotions. You’re being kind to the planet, creating a vibrant local economy, and giving someone a gift they can use but that won’t require long-term storage. The best part is that you can tailor the basket’s contents to the recipient, including their favorite foods, soaps or lotions with their favorite scent, etc. 4.) Go digital. If you’re shopping for a bibliophile who also owns an e-book reader (or uses an iPad or smart phone to read books), an e-book allows you to give them a gift sans wrapping paper—and they won’t need to buy a new bookcase to house their growing collection. I can keep a library of 3,500 books on my Kindle. When I move, it’ll be much easier to move those thousands of books than it will be to pack up my hard copies. Digital music files allow you to give someone a good soundtrack for their days (and nights) without buying a CD or vinyl (yes, my musician friends assure me that vinyls are back in style). 5.) Give the gift of giving. Lots of nonprofit organizations allow you to make a donation in recognition of someone else. If you know someone who’s a cancer survivor, an animal lover, or who has an issue he or she is passionate about, a gift to a beloved cause can be just as nice as one wrapped up in paper and bedecked with a shiny bow. What about you? How do you celebrate the holidays without amassing a house full of stuff? Finally, in the wake of a senseless tragedy, the Virginia Tech community is showing the world that, in the face of hate, we can sow seeds of love; that the community is one defined not by tragedy, but by resilience; and that the university motto, Ut Prosim (That I May Serve), continues to thrive. See how students established a memorial fund for the family of a fallen Hokie. Whatever holiday you celebrate, and however you share and spread joy, I hope your season is full of gratitude, love, and friendship. Happy Holidays. We have so much stuff, it’s ridiculous. Time for another yard sale. We’ve done the gift exchange with both sides of the family and it does work out much better than buying something for everyone. The family is much bigger now and it’s just not practical to do that anymore. Your mother-in-law’s homemade cocoa sounds like a great gift. And so are home baked goodies. I agree that less is more. Helps keep our lives less cluttered. I’m working on that right now! Lynn, thanks for stopping by! Now that the holidays are over, I feel the need to purge some of my stuff. 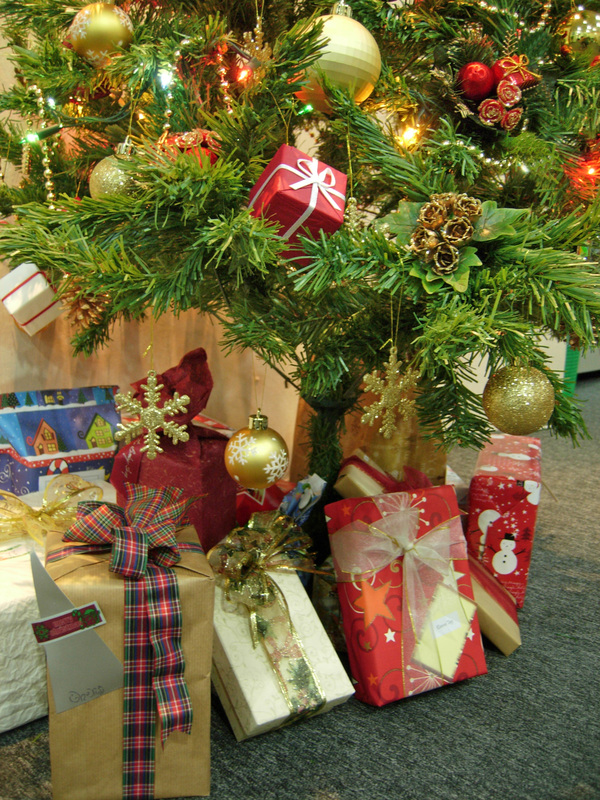 But Secret Santa gifts definitely eliminate some of the post-Christmas clutter! We celebrate every year with all the cousins and aunts and uncles on my dad’s side of the family, and now we’ve started to add spouses as those of us in the “kids” generation get married and start families of our own. We’ve pretty much given up on exchanging gifts because of our numbers, but I like the idea of drawing names. I’ll have to propose that. Marcy, the gift exchange definitely simplifies things; and the more people you have, the more fun it is. I hope your family gets to try it some time! Hope you had a great holiday season! I’m a big fan of clutter-free gifts! My parents always get concert tickets or gift cards, and they love them because they don’t need or want more *stuff. * Great idea on charitable donations! Let’s do this old fashioned way of nutritional cooking recipes cooking. you try this recipe for your dough when baking. With the push of a single button, a user will be able to launch a series of complicated commands. threatens to leave and then offer them the world to stay. The game begins to develop throughout popularity through This summer regarding 1986 it really is hard-wired to the Apple 2 and also Commodore 64.